The Burton Juice Wagon in some ways is a pointy nosed reincarnation of the discontinued Burton Supermodel with less of a set back for more centered riding. A lot of old schoolers feel that camber is better in powder because you can get more pop from an ollie off natural terrain and snap off lips etc. Most feel that s-rocker helps you accomplish the same thing and but some feel that it’s not quite the same. For those that feel it’s not the same here is the Juice Wagon. There use to be many camber tapered directional freeride boards but these days there are only two well-known camber boards. The Burton Juice Wagon and the Salomon Burner. 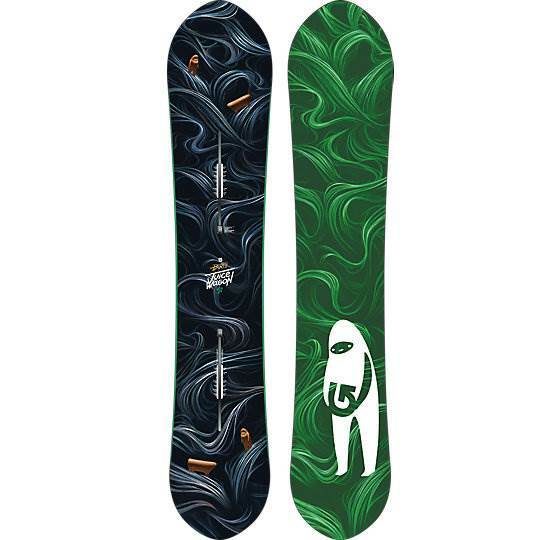 As we said before this is an upgraded Burton Supermodel and it’s made to ride a little longer than your average board. It’s nice to see that in a time of reduction by Burton and some other companies that they still have an opposite option. 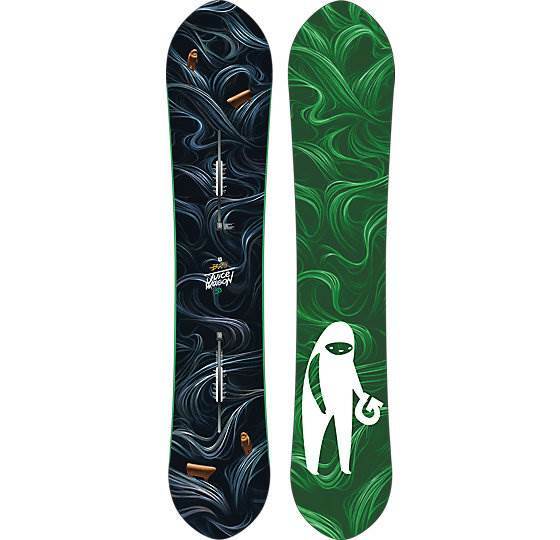 On Snow Feel: If you like a tapered directional ride on groomers then this is a great board. This is like taking the Burton Custom Camber, extending the length and setting back the stance further. It’s a very stable but catchy ride that invites a carving type of approach to the mountain. Powder: Many would say the Juice Wagon is good or great in powder and not excellent because the float and turn initiation takes more work than an S-Rocker or other hybrid shapes in the deep stuff. The rating of excellent is there because this is excellent for an old schooler who likes a little taper, the drive, and pop of camber and a more centered stance. 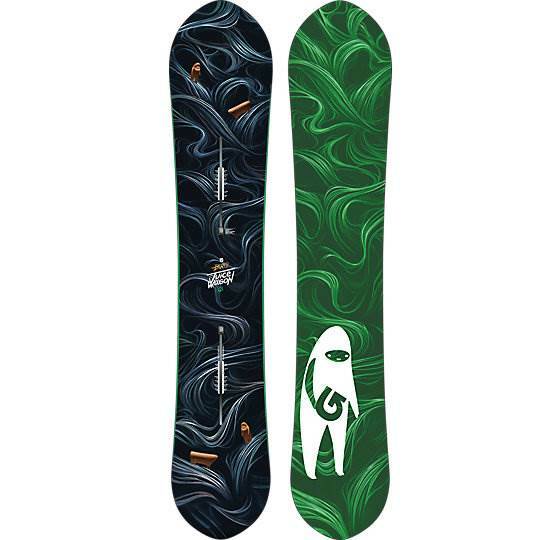 For an old-schooler this will be easy to turn and slash in the powder or trees but for those that like a little rocker in the nose on pow days won’t think it’s that easy compared to a board like the Burton Barracuda. Turn Initiation and Carving– The Juice Wagon takes some work to turn and most old schoolers like that. It’s very easy to lean into a carve when the conditions are good but it’s not an all conditions carver. Quick short radius turns take a little more work than most hybrid shapes but it’s easier than a non-tapered camber shape. Wider arcing turns are what this board is made for. Speed: This is almost chatter free and that’s pretty impressive for its medium/stiff flex. There are faster boards out there but it’s really close to excellent. Uneven Terrain: Burton does a great job with being able to take on uneven and bumpy snow. If the snow get’s rutted up you can continue on without too many issues. Approximate Weight: It’s pretty light but its not going to break any records. It’s sized bigger than most boards so it will be a bit heavier but pound for pound it’s pretty light. Edge hold– The tapered shape takes a little from the edge hold. You have a lot of effective edge on the snow but if you try to carve like on a non-tapered board you’ll wash out. Most know that this is more a ride off the tail kind of board. When the conditions get hard the edge hold is missing the grip that some boards have these days. Flex: Right there between med/stiff and medium. It seems to have a little more torsional rigidity than its flex but that could be in our head. The board doesn’t feel as aggressive as the flex but it can ride pretty aggressive. It’s not really a butter around kind of board. Switch: So the .5″ or 12.5 cm set back doesn’t put you that far back on the board so it’s ok to ride switch but the biggest difference between tip and tail is the 10mm taper that will make it a bit different each way. It’s borderline good but more average riding switch. Not a bad board for those that occasionally like to ride switch for a traverse or get the sore out of your back leg after you leave a powder area to head to the chair. Jumps: for directional riding the Juice Wagon has lot’s of pop and actually is better than the old Supermodel here. Of course, this isn’t a park lapper but if you like to spring off natural terrain in powder or non-pow days your going to have a lot of fun. You will get a little extra spring. If you pair this with the Diode EST it will be even more fun as they add more spring in your Ollie. The rest of the categories don’t matter for this board. For example, Jibbing on this board is like sending a Mormon to Burning Man….to party….not to convert people. We try to get as many images of the Burton Juice Wagon, but forgive us if they're not all there. Response: Good point. Yeah a pointier tapered custom is a good way to describe it. Response: The Flight Attendant’s S-Rocker is almost all camber with only a little bit of rocker right before the nose so to us it’s much more apples to apples. Comparing the Juice Wagon to the Burton Barracuda which only has a little camber would be apples to oranges to us but this almost all camber ride felt much more comparable. I was hoping you would elaborate on the differences between the two boards you rode? Your different opinion might help other readers.